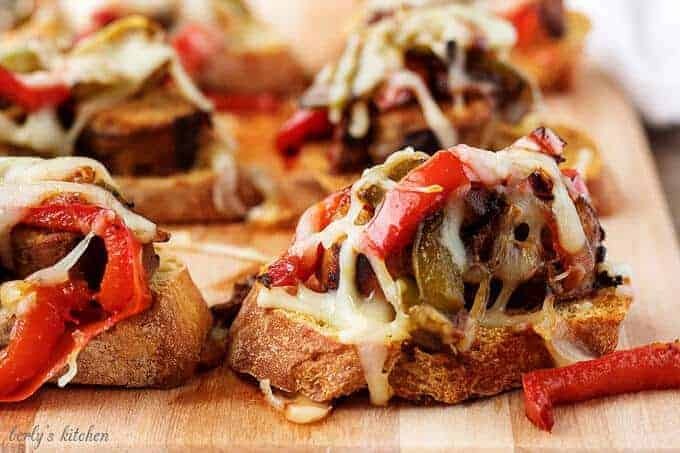 This recipe for sausage and peppers crostini is a simple appetizer combining the classic flavors of Italian sausage, sweet peppers, and spicy onions, topped with savory mozzarella. The big game is almost upon us and now is the perfect time for appetizers! However, with the holidays just ending, nobody wants to stand in the kitchen all day just to whip up a quick snack. 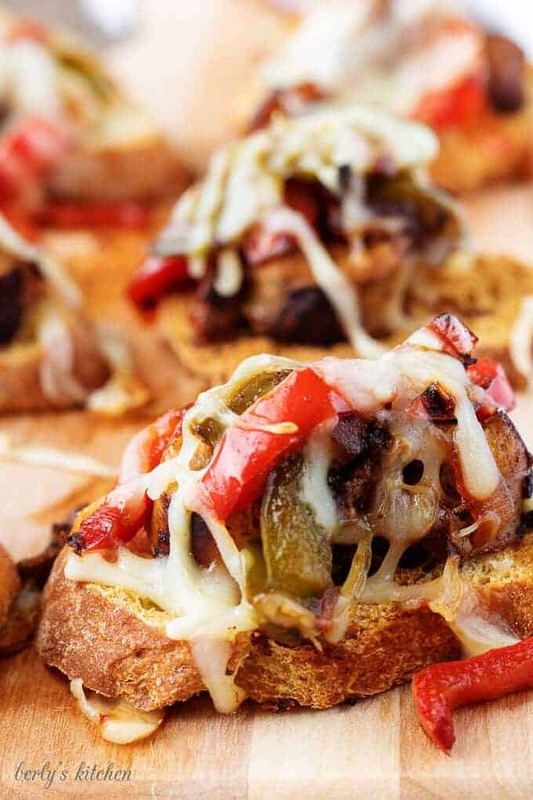 That’s why Kim and I are sharing our simple recipe for sausage and peppers crostini. 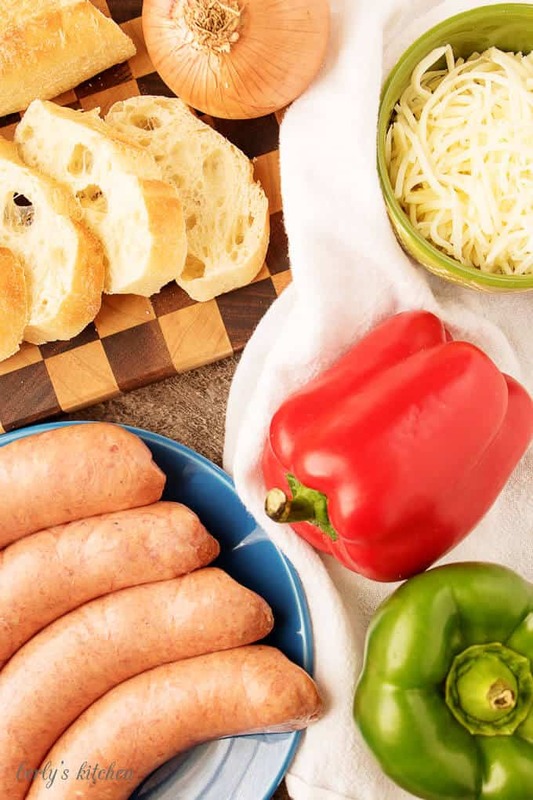 In less than an hour, you have a delicious, bite-sized app loaded with sweet or spicy Italian sausage, sweet green and red peppers, spicy onions, and savory melted mozzarella cheese. It doesn’t get much better than this for quick game day eats. We can’t wait for you to try them. First, preheat your oven to 350 degrees F. and slice your baguette, then wash and cut the onions, and peppers into strips. Next, saute the Italian sausage in a skillet over medium heat for 5-7 minutes on each side or until the sausage is almost done. After that, add the onions and peppers to the skillet and cook everything for an additional 7-8 minutes or until the peppers and onions are soft. Now, place the baguette slices on a sheet pan and put them in the oven for 3-5 minutes so the bread can toast. Remove the crostinis from the oven and set them aside. Afterward, slice and layer the sausage, sweet peppers, white onions, and shredded mozzarella cheese on the toasted crostinis. Last, place them in the oven to bake for 3-5 minutes or until the cheese has fully melted. Remove the finished appetizer and serve immediately. To reduce the fat in this dish, try using turkey sausage or low-fat mozzarella cheese. When slicing the peppers, make sure to remove all the white portions inside of the pepper. If left in, they will make the peppers taste bitter. For a crisp casing on the sausage, preheat your saute pan for 2-4 minutes before adding the raw sausage. The hot pan will sear the meat, locking in all the juices. Looking for other great appetizers? Then try our Simple Tomato Bruschetta or our Crab Stuffed Mushrooms Recipe! 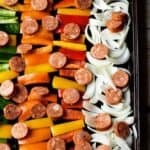 Don’t forget about our other Sausage and Peppers Recipe. 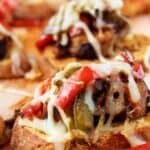 If you like our Recipe for Sausage and Peppers Crostini, please leave us a comment and rate the recipe card. You can also find us on Facebook, Pinterest, Twitter and Instagram searching for Berly’s Kitchen! Next, saute the sausage in a skillet over medium heat for 5-7 minutes on each side. 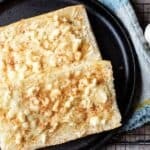 Now, place the baguette slices on a sheet pan and put them in the oven for 3-5 minutes for the bread to toast, remove them from the oven and set them aside. 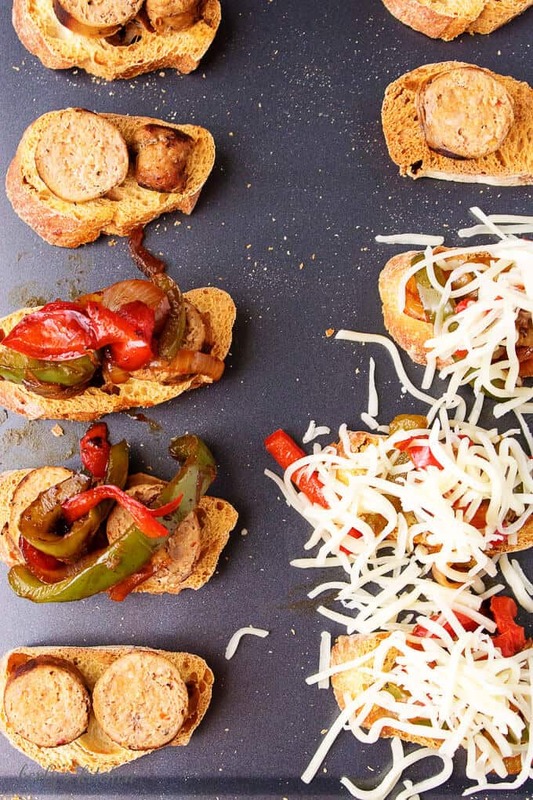 Afterward, layer the sausage, peppers, onions, and mozzarella cheese on the toasted crostinis. The calories listed are an approximation based on the ingredients and a serving size of two crostinis. Serve the appetizer while it is hot and storage is not recommended as the grease from the sausage will make the bread soggy. These look delish! A perfect snack for guests, and they would go great with either wine or beer. I love a good, classic meal. 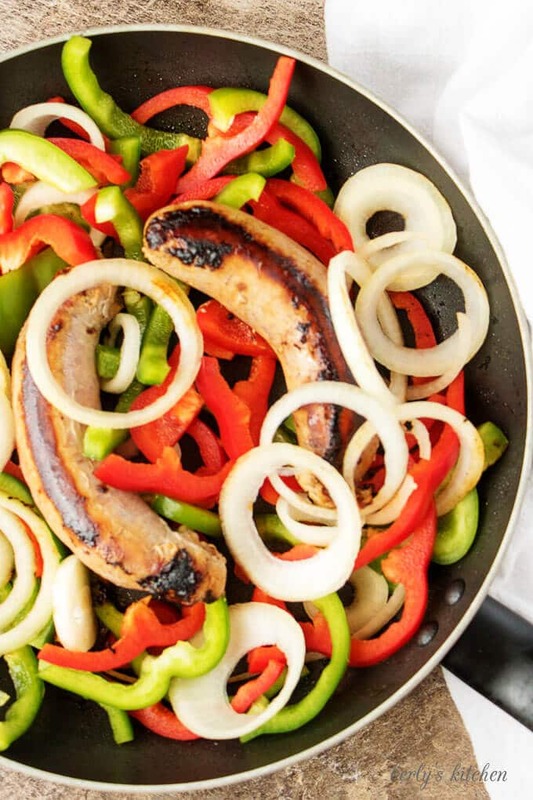 Sausage with peppers is a great comfort food. This is a dream meal for me! I love sausage and peppers, and together even more so. My son loves them too. I will come back to your post! I love crostinis … These is a great take on them … Love the pictures. Mmm this looks so tasty and the perfect comfort meal for Winter! These look so good! Now if only I could lift these right off the screen and eat…! I love how easy these are to make and sometimes I might have two appetizers instead of a meal.